It is likely that the name of this hill was simply An Binnín and that the name Cnoc an Bhinnín arose from the need to distinguish the hill from the townland of the same name. Binnion is the 1278th highest place in Ireland. The minor road, to the south of Binnion, has had some road works carried out on it recently. The upshot being, it is possible to park a car on the verge and leave the road clear, at around C376476 D.
From here walk up hill to the track beside the cottage at C375479 E, mentioned by eflanaga, and follow this to a fork, either one brings you out onto the open hillside. And if you bring a carrot, the friendly horse in the field, at the fork, would appreciated! From here follow the track up hill (faint if you have taken the right fork) into the gap, where the track is clear and easy to follow. 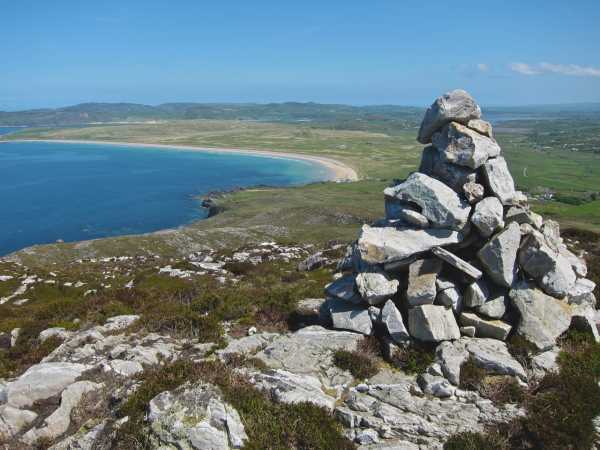 Just as the track swings left there is a minor ring contour, on your right, topped by a cairn at C374491 F, which is worth climbing up to for the view of Pollan Bay (see attached photo).